This book is published at the time when the European Commission unveils its plan for a Blue Card for skilled immigrants that would allow suitably qualified people and their families to live and work within the European Union. The aim is to attract skilled workers needed in ageing Europe over the next two decades. The timeliness of our study about the challenges for the Europe’s demographic future and social cohesion which are associated with the immigration flaws and the presence of third-country nationals in the European Union cannot be overestimated. That is why the authors and in particular the project coordinating institution Bundesinstitut für Bevölkerungsforschung (BiB) headed by Prof. Dr. Charlotte Höhn have made an exceptional effort to ensure a speedy publication and dissemination of the results. We present in this book the analyses of the viewpoints of citizens towards immigration and integration of foreigners and relate these views to the socio-demographic features of the natives, and their attitudes and expectations towards general population trends and public policies. The study covers eight European countries: the CzechRepublic, Germany, Estonia, Hungary, Austria, Poland, Slovenia, and Finland. The analysis builds on the national Population Policy Acceptance Surveys (PPAS) and the international database FEMAGE-MIG (Avramov and Cliquet, 2007a) constructed in the framework of the EC funded research project ‘Needs for Female Immigrants and their Integration in Ageing Societies’ (FEMAGE, 2005-2007). In Chapter 1 Dragana Avramov and Robert Cliquet provide information on the design and contents of the Population Policy Acceptance Survey (PPAS) and the module on immigration and foreigners, and describe the FEMAGE-MIG database, methodology and opportunities for data analysis. In Chapter 2 Robert Cliquet, in collaboration with Sanja Cukut, Katerina Danielova, Richard Gisser, Irén Gödri, Izabela Koryś, Beatrice Manea, Robert Naderi, Asta Põldma, and Minna Säävälä, sets the stage for understanding similarities and differences in attitudes of the population by presenting some basic facts and figures about the presence of foreigners and the legal and policy framework conditions in the eight countries under consideration. In Chapter 3 Minna Säävälä addresses the question of who is perceived to be a foreigner and does this identification correspond to the actual presence of foreigners in a given country. She also assesses the level of knowledge about the size of the foreign population and the perceptions of whether there are too few or too many foreigners. In the 6 sections of Chapter 4 authors deal with several groups of attitudes towards the resident foreigners. 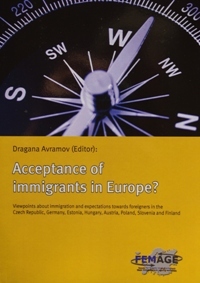 Dragana Avramov looks in section 1 at the prevalence of positive and negative attitudes which cut across two clusters of issues: attitudes about demographic and labour market advantages and disadvantages of immigration and the presence of foreigners and attitudes about cultural diversity and integration, and policy measures towards immigration and integration of foreigners. In section 2 Dimiter Philipov undertakes an analysis of the attitudes on demographic advantages and disadvantages in view of expected population decrease and persistent low fertility. In Section 3 Robert Cliquet addresses attitudes on the labour market advantages and disadvantages of the presence of foreigners. In section 4 Robert Naderi assesses the impact of education on attitudes towards cultural diversity and integration of immigrants. In Section 5 Dragana Avramov highlights the meaning of integration from the point of view of natives, and between-country differences and social differences with respect to the cultural diversity and expectations towards the integration of foreigners. In Section 6 Dragana Avramov analyses the attitudes on policy measures aimed at admitting and integrating immigrants in the host society. Chapter 5 consists of 5 sections. In Section 1 Kalev Katus, Allan Puur and Asta Põldma focus on the relationship between the acceptance of immigration and the evaluation of demographic trends by the native population. In Section 2 Majda Černič Istenič and Duška Knežević Hočevar look at whether the attitudes of citizens towards immigration relate to their attitudes towards gender relations, fertility and the meaning of children. In Section 3 Irena Kotowska confronts attitudes towards immigration with attitudes towards ageing. In Section 4 Dragana Avramov looks to what extent does satisfaction with housing, immediate environment, standard of living, work and work-free time relates to the positive or negative attitudes towards immigration and migrants. In Section 5 Irén Gödri analyses attitudes towards immigration and migrants against general values of people. In Chapter 6 Dragana Avramov and Robert Cliquet provide a parsimonious comparison of the key findings from the FEMAGE-MIG database with the findings from the Eurobarometer and the European Social Survey. In Chapter 7 Dragana Avramov draws conclusions and highlights the policy relevance of the overall findings.